How can I update my existing installation with the latest version without losing config and settings? I got a "Request for the permission of type 'System.Web.AspNetHostingPermission..." error. I got a "Compilation Error ... Compiler Error Message: CS1501: No overload for method 'AsHash' takes 0 arguments" error. After auto-upgrade, i got a "Compilation Error ... Compiler Error Message: CS0009: Metadata file '...' could not be opened -- Illegal tables in compressed metadata stream." error. I got a "Could not find part of the path '...\bin\roslyn\csc.exe'" error. I can't install the application. Is there anybody why can help me? How can I restart the application? How can I change the logo or top header? How to branding of e-mail for sending public links? How does HTTP Commander control user's count? How can I use HTTP Commander with SSL? Can the first loading process be faster? Can I make the application faster (increase performance)? Loading of folders/files list is very slow (specially for a network folder) and takes several seconds. If I map a folder I get the error "The folder you entered does not appear to be valid..."? I got an "Access to path '...' is denied" error. I got The page cannot be found error (error 404) when I open http://localhost/HTCOMNET/default.aspx or any other page. I see the page with ASP.NET tags at the top e.g. "<%@ Page Language="C#" %>". I got a "Required permissions cannot be acquired" error. I got a "Request for the permission of type 'System.Security.Permissions... error. I got a "Internet Explorer cannot download Download.ashx from [domainname]" error while a file was being downloaded. I got a "Server Application Unavailable" error. I got the Error "500.19" at web.config file ("modules" section). Does HTTP Commander support Web garden or Web farm? Is HTTP Commander supports file solutions like DFS folders, UNC folders, ABE, NAS? How Can I configure documents management features like Google docs, MS Office and OpenOffice online edit? Can I pass some settings in URL? 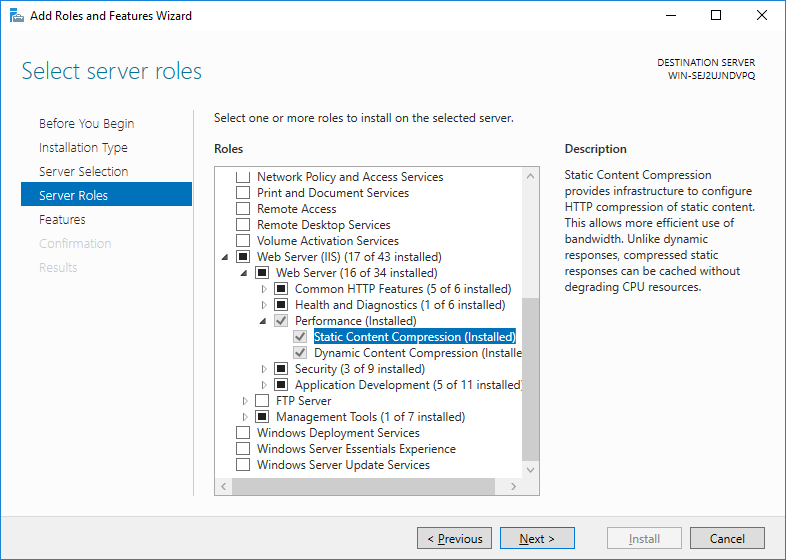 How can I add Static Content Role service at IIS? How do I protect configuration files (prevent them to be retrieved by users)? The Default.aspx page is incorrectly displayed. I got the Error HTTP 403.18 - Forbidden when open files from folders with dots in name. I got the error The parameter is incorrect when open file list. Why Microsoft Office still opens my document (View / Edit → Edit in MS Office) as read-only? Error on download/upload with Dropbox or Box: Could not load file or assembly 'Newtonsoft.Json, Version=...'. How to disable WebDav feature? Page reloaded when file list is scrolled up in Chrome browser on Android. IE browser does not rotate image loading. How can I hide files/folders that the user does not have rights to read? How can I create a "dropbox" for users (student can upload their own files but can't view other students files)? Every time I insert my login and password in the authentication window I get a "You are not authorized" error. Why would I need to use Basic authentication instead of Windows? 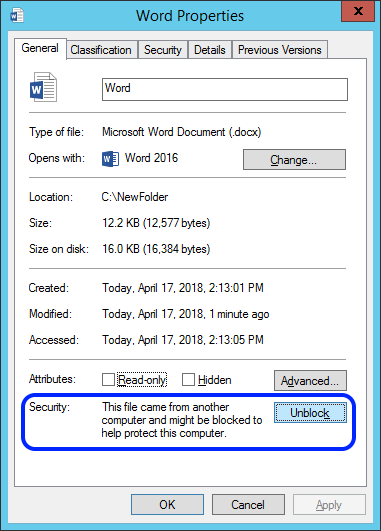 May I use network folders with Windows Integrated Authentication? I can't create access for a group or to a home folder. Can I setup access only for single OU (Organisational Unit) of domain? Can I use application in DMZ and what ports for firewall should I open? Loading of folders tree is very slow and needs a few seconds. Can I use Forms authentication (Form at the web page) instead of standard browser popup authentication window? How do I clear windows authentication on Log out? After changing my username in Active Directory/WinNT I can still login to HTTP Commander, but then I don't see any of the folders. When opening - request of authorization occurs 2 (or more time) and after login form for Forms version opens. How can I display some text when user logs into HTTP Commander (at the time when popup login window appears)? When I receive or edit files in OneDrive, Office 365, Dropbox, Box, I get the error "Access to the path '...' is denied." Answer: Please refer to the Upgrade section of documentation. Answer: Problem related to Windows Server security. You need to unblock HTTPCommanderAJSx.x.x.zip (distribution archive) file because it came from another PC (Internet) and then extract it to HTCOMNET folder again. Restart the application after this (close w3we.exe process). See Installation section how to unblock files. Answer: You must add a section system.codedom in the Web.config file with the latest version of the compiler. See Update Manual. Answer: see note for auto-upgrade. Answer: You must copy the bin\roslyn folder from the distribution to the bin folder with the HTTP Commander application installed. Answer: You can run Diagnostics and look for known problems. If you can't run the application or configure folders, we offer free installation assistance for both trial and commercial licenses. You can get help via email, instant messenger or via remote access to your server. You only need a few minutes to get online help. Answer: To restart the application, click the "Restart" button in the Admin panel. Also to restart the application, you can make some changes in the Web.config file (e.g. add a spacer in any comment). The Application will restart automatically. Note. 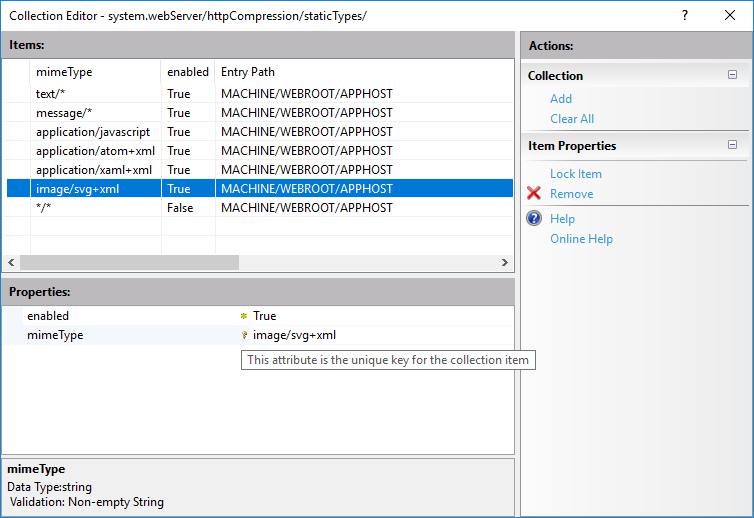 Instead of the "%WINDIR%\Microsoft.NET\Framework\v4.0.30319\Temporary ASP.NET Files" path, another can be used, see the tempDirectory attribute in the system.web/compilation section of the Web.config file in the [HTCOMNET] folder. Click here to read more about setting your logo. Answer: HTTP Commander controls user session count and unique user's names. A new session is created for every visitor. Each user can have a few sessions if he doesn't clicked logout button. But after 1 hour, the session is closed automatically. To terminate existing sessions by yourself, you need to restart the application. Answer: HTTP Commander works both with http and https protocols. http protocol works out of box. 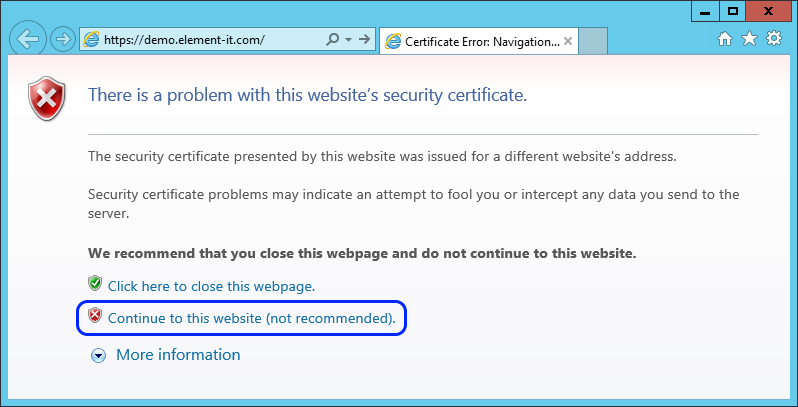 To enable https protocol, you need to install an SSL certificate on IIS. The instructions below describe how to order a certificate from a globally recognized certificate authority (recommended option) and how to create a self-signed certificate. A self-signed certificate will allow you to use the https protocol, but the web browser will warn that the certificate is not valid since it comes from an unknown authority. To get a certificate that passes verification, you need to either order a certificate at a globally recognized certificate authority, or establish a trusted authority inside your corporate network. As an example we consider ordering a certificate at Thawte. You may choose any other authority you trust. Select a certificate for your web site: SSL certificates. 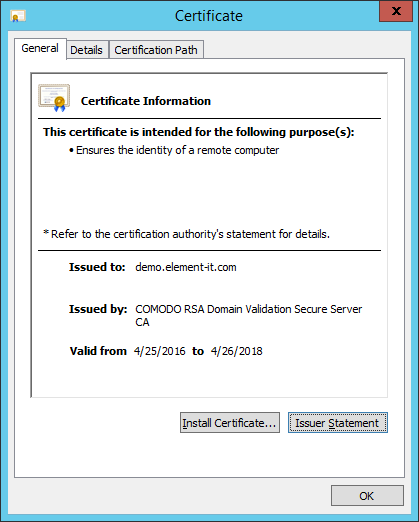 Generate a Certificate Signing Request as described in Key and CSR Generation Instructions. You'll need it later. Click the Buy button to order the chosen certificate. You'll fill out a number of web forms in the process. At one step you'll have to specify the Certificate Signing Request. 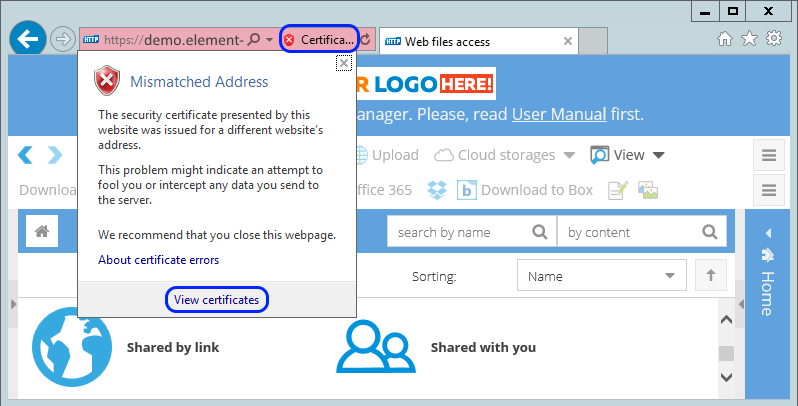 Track the status of the certificate in Thawte Certificate Center. Install the SSL certificate according to Thawte manual. Specify a friendly name of the certificate in the opened dialog box. That may be any name. Click OK button. The certificated is created, you should see it in the Server Certificates list. In the Site Bindings dialog click the Add button. Change any other settings in the dialog box, if changes are needed, click the OK button. Click the Close button to close the Site Bindings dialog. You're done now, you can use the https protocol to connect to HTTP Commander. A self-signed certificate is untrusted by definition. The web browser will warn you about the problem when you try to open a web site with untrusted certificate. WebDAV over https with invalid certificate works unreliably. While web browser will warn you about the problem and allow you to proceed, WebDAV may refuse to connect to the web folder with a misleading error message. You may circumvent the problem by installing self-signed certificate into the trusted authorities container on the client machine. Click "Certificate Error" Security report on the address bar, then click the "View certificates" link in the pop-up window. Click the "Install Certificate" button in the certificate properties window. 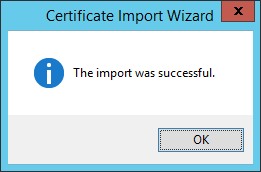 Click "Next" in the Certificate Import Wizard. 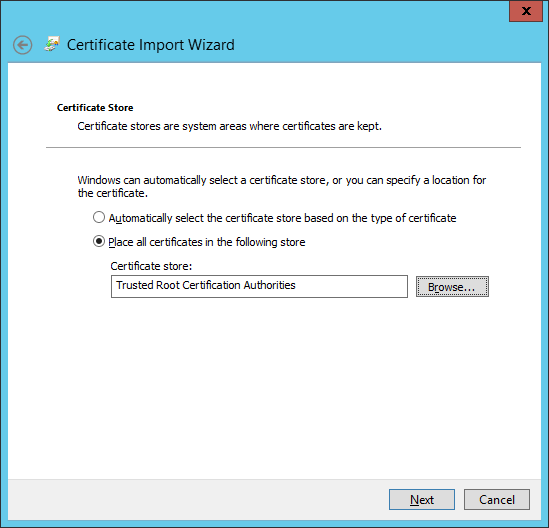 On the next step, "Certificate Store", select "Place all certificates in the following store", in the "Certificate store" field select "Trusted Root Certification Authorities". Click "Next". HTTP Commander have caching enabled by default for /Images, /Scripts folders and for styles.css. styles-min.css files. Max-Age used to control caching of these resources and it set to 365 days by default. 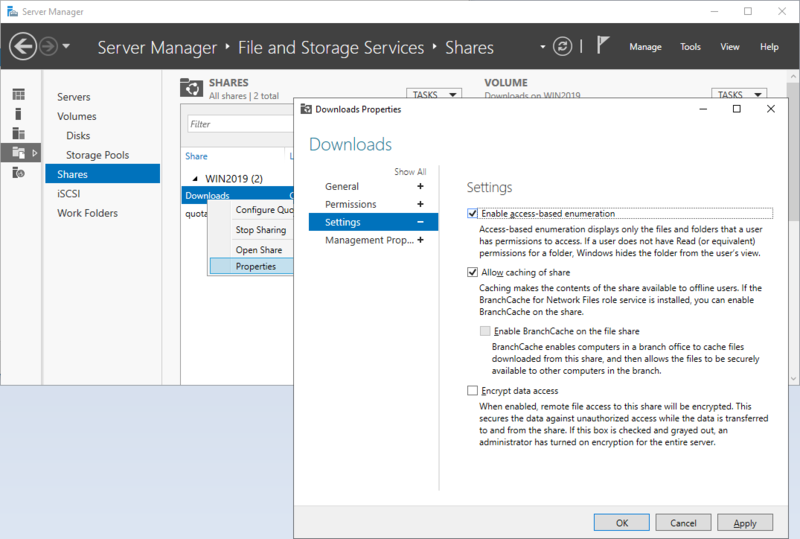 Caching is not enabled for whole application to prevent caching of downloaded files. 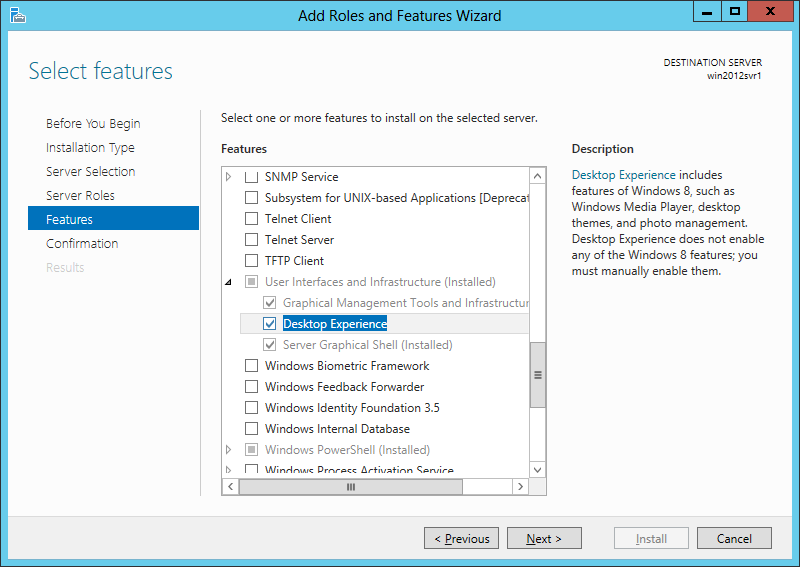 Please note, that profiles of caching section is cleared to make IIS correctly send Cache-Control header in response. If this section is not cleared, IIS still adding no-cache attribute to Cache-Control header. You can make even the first loading process faster if you enable gzip compression in the IIS settings. With gzip enabled, the loading is 4-5 times faster. You need to enable gzip for static and dynamic content (*.js, *.css and *.svg (image/svg+xml mime type) files). 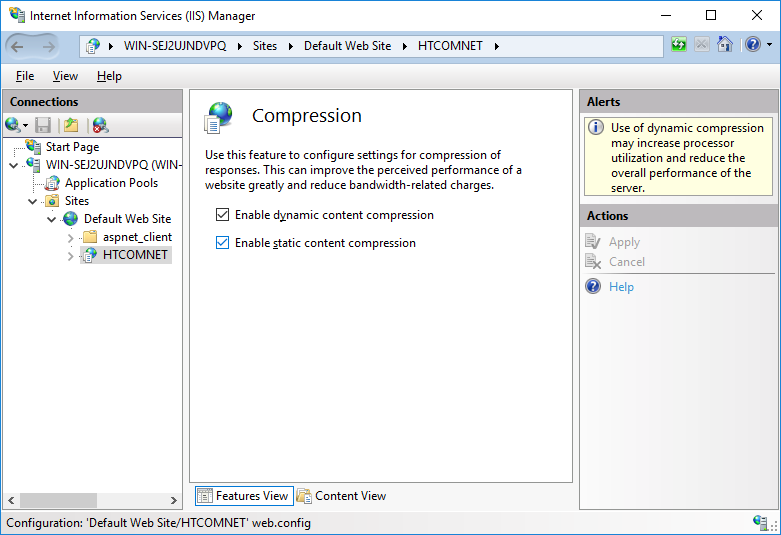 See article how to enable compression in IIS. Download the trial HTTP Sniffer to test if the compression works successfully. You can setup content expiration for the Images\ folder so images will be loaded for the user once and requests "if-modified" will not be sent again during the next logon. This can increase performance in some cases because application uses many images. To setup content expiration expand the HTCOMNET\Images\ folder, then in the right panel open "HTTP Response Headers". Choose action Set common Headers... and set content expiration on 2028 year (for nearest 10 years). You can disable the tree view or make it not auto collapsible. This makes the application faster because no requests for tree updates are needed. To disable tree set the HideTree parameter in the Application settings to "false" or set the parameter TreeView value to NotAutoExpandable. Don't use a lot of columns for the files grid at DisplayedDefaultColumnsInList parameter of Application settings. Rendering files grid takes some time at the users side if there are many files in the folder. Note! Don't test application performance with IE 11. This version works ineffectively with java scripts and HTML objects. More popular browsers like Chrome, Firefox, Edge are a few times faster. It could be related to usage of NTFS alternate streams by HTTP Commander to store/read custom metadata on files and folders. They used to store such information as Labels, Comments, File history, downloads counting and custom details fields. DisplayedDefaultColumnsInList - Remove downloads and other custom fields (like comments, description) which are stored in metadata from the list of available columns in file list. By default they are not included. EnableFilesFoldersLabels - Set the value to false. ShowFileMarkWhenExistsDetails - Set the value to false. Configuring these parameters is enough to disable load of metadata for each file during load of file list for folder, which may significantly speed up loading for network folders. While you still will be able to see downloads count (if download counting is enabled), comments, description and other custom metadata fields in file properties window and in file details panel. 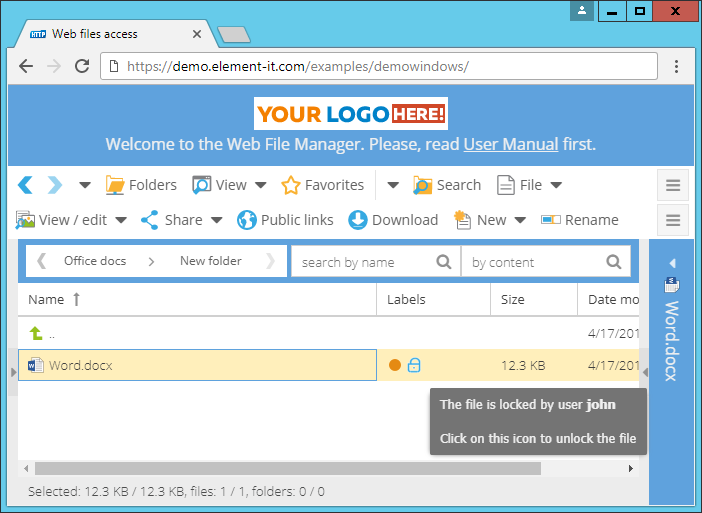 Answer: First, try to map folder "https://demo.element-it.com/windows/hcwebdav" (without quotes). If it doesn't show the error and asks for credentials then it works (you can use demo/demo credentials). If mapping demo folder works but it doesn't map your application link, then the problem is with the application or WebDAV configuration. Check web folders mapping setup or contact us. Answer: The problem is related to the NTFS permissions. 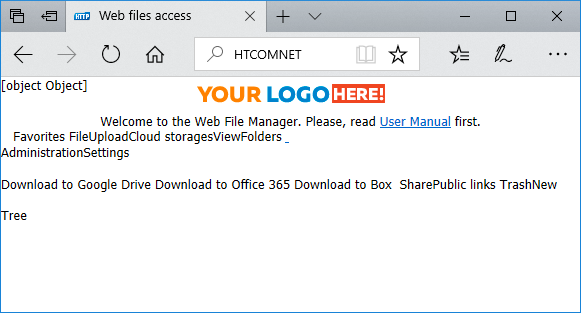 Check the NTFS permissions for HTCOMNET, data and your main content folders. See the NTFS Permissions section of the Documentation. Answer: If you are sure that the path http://localhost/HTCOMNET/default.aspx exists but you are still getting the error, it means that the IIS doesn't execute ASP.NET code. This problem occurs if your IIS was installed after the .NET Framework installation. Answer: ASP.NET has not started on the server and you have opened pages like clear HTML. See the "Application Install" section. I got a " Request for the permission of type 'System.Security.Permissions... " error. Answer: Both errors can be related to "Full trust" level. Check if "Full trust" is enabled for HTCOMNET application. See the Application Install section. Also, check the permissions for IIS APPPOOL\DefaultAppPool" user on the HTCOMNET folder as well. See the NTFS permissions section. Tools → Internet Options → Advanced → Security → uncheck "Do not save encrypted pages to disk". By default this option is unchecked. If the option is checked, the files cannot be saved from any SSL website. The problem can appear because ASP.NET 4.5 and ASP.NET 2.0 applications are being used by the same pool. Check all your applications in IIS and set one application pool for the applications running under .NET 4.5 and another pool for applications running under .NET 2.0. There are not enough NTFS permissions to HTCOMNET folder. 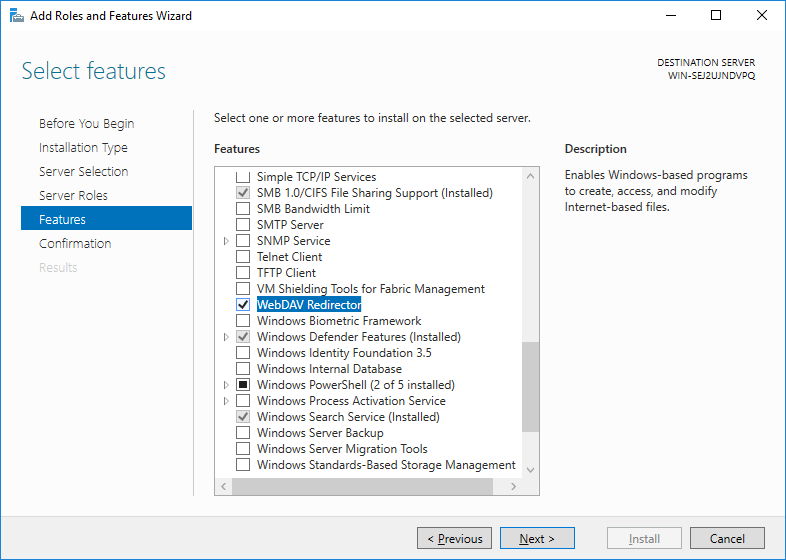 See the NTFS permissions section of the Documentation. There can also be some other reasons. You can try to restart the application. Answer: This error can occur if you you have disabled some features of Web.config to delegate. In most cases it occurs with the "modules" feature. You should open IIS, click the server root in the left tree. At the right panel, open "Feature Delegation", then Select "Modules" and change its delegation type to "Read/Write". If you have the error with other features, then set the delegation type for the other features. Answer: No. 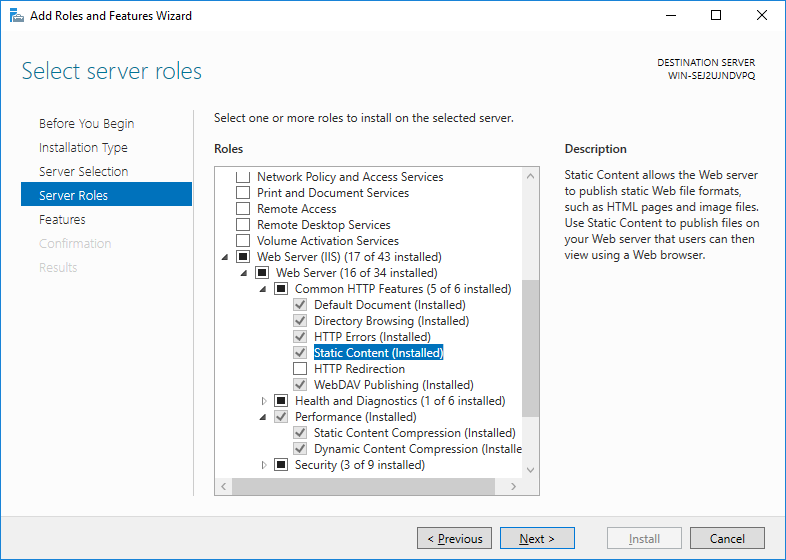 HTTP Commander is running but does not work correctly if you have web garden or web farm enabled in IIS. Check if you have enabled web garden in the application pool settings and disable it or create a new pool for HTTP Commander. You should use only one worker process for the application. Answer: Yes, it supports DFS, UNC, ABE, NAS and most other file related Windows Server technologies. First you would set up the folder in the Admin panel. Then type the path to the DFS folder like \\domain\foldername or UNC like \\servername\share\folder. If you set up UNC remote folder at the remote server or your DFS folders stores folders at remote servers then check if Basic Authentication is enabled in IIS settings, not Windows Integrated (for Domain network it is possible to use Windows Integrated authentication: May I use network folders with Windows Integrated Authentication?)! See why Basic authentication should be used. For Domain network it is possible to use Windows Integrated authentication: May I use network folders with Windows Integrated Authentication? For ABE see more info here. Answer: All info related to documents management features is described in the Application settings section. Use "Default.aspx?Language=English" to pass default language. Use "Default.aspx?theme=themename" to view interface with specified theme (see StyleThemeName parameter). Use "Default.aspx?folder=foldername" to open a specific folder first. Use "Default.aspx?file=path/to/file" to open a folder with the file and highlights it. Use "Default.aspx?isEmbeddedtoIFRAME=true" to show interface for iframe mode (with small icons). See IsEmbeddedtoIFRAME parameter. Use "Default.aspx?hideTree=true" to hide (or show by default if value is "false") tree panel with folders on left side (see HideTree parameter). Use "Default.aspx?TreeView=disabled", "Default.aspx?TreeView=enabled" or "Default.aspx?TreeView=notautoexpandable" to change view of tree panel with folders on left side (see TreeView parameter). Use "Default.aspx?defaultGridView=thumbnails", "Default.aspx?defaultGridView=tiles" or "Default.aspx?defaultGridView=detailed" to show file list in thumnails or detailed mode (see DefaultGridView parameter). Use "Default.aspx?Mobile=" to show the mobile interface (Smartphones) by default. Use "Default.aspx?Standard=" to show the standard interface (non Mobile) by default. How can I add Static Content Role service at IIS7? Start → Administrative Tools → Server Manager → Roles. 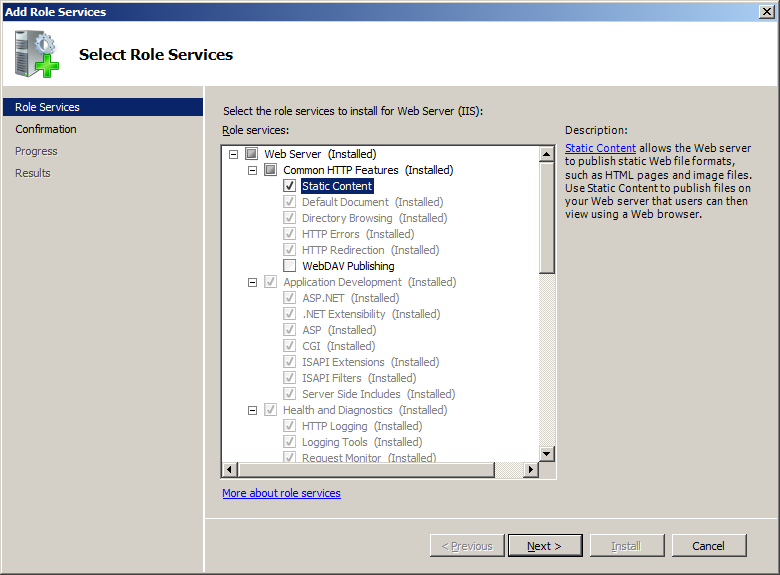 Find in the right list the Web Server (IIS) role and click the Add Role Services link. In the new window check Static Content, and then click Next and then Install buttons. Answer: HTTP Commander stores configuration data on the server in a number of files. For security reasons, it is recommended to prevent users from retrieving them, since they expose sensitive information about the application. Configuration files are: Web.config, HttpCommanderSettings.config, .xml, .db files in the Data folder. Web.config, HttpCommanderSettings.config files are protected by default. .xml and .db files in Data folder are protected via the following section in Web.config file (in case of trouble make sure these settings are present in the configuration file). 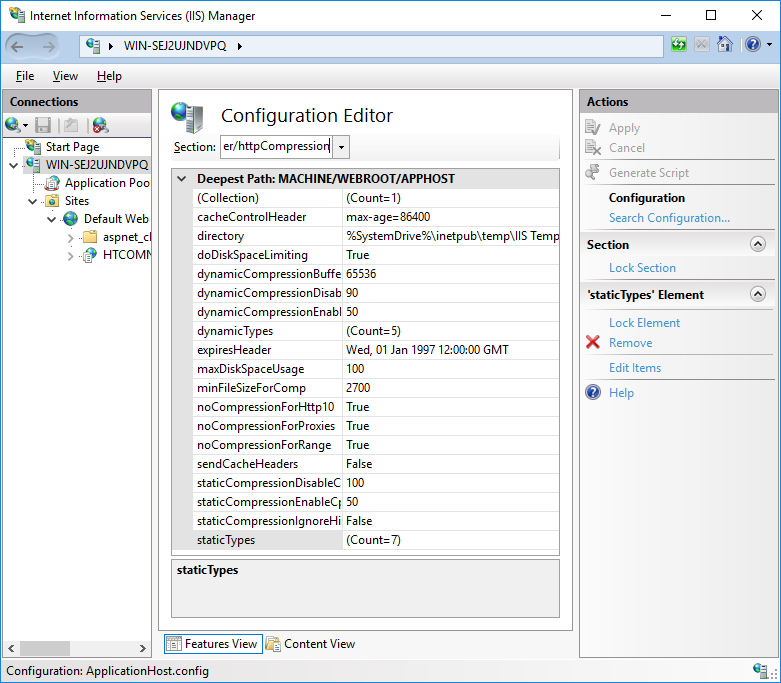 In IIS configuration is restricted to Web.config file. See also, how to prevent files download from Data folder. HTTP Commander includes examples of Single Sign-On (SSO) both for Basic Authentication and authentication via Form (for Active Directory users). 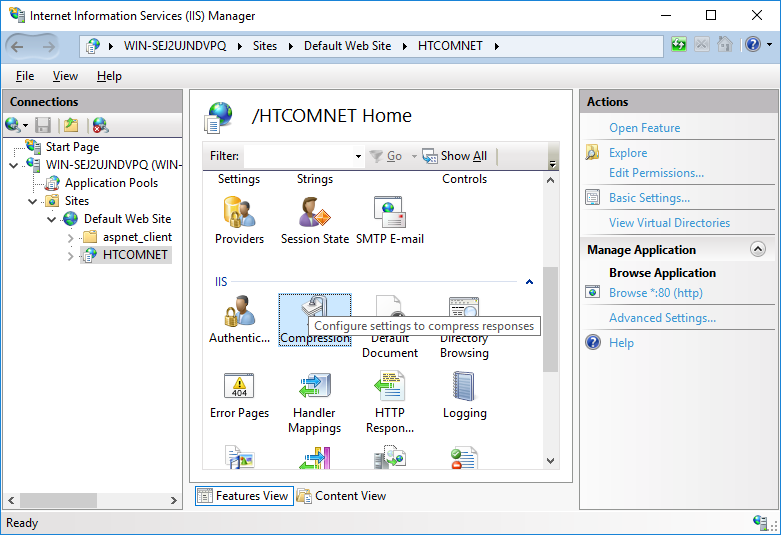 HTTP Commander with Windows Authentication (Windows or Basic Authentication in IIS, and ASP.NET Impersonation is turned on). You may delegate authentication to the application by means of asynchronous HEAD request to Default.aspx page. The request should possess valid credentials. 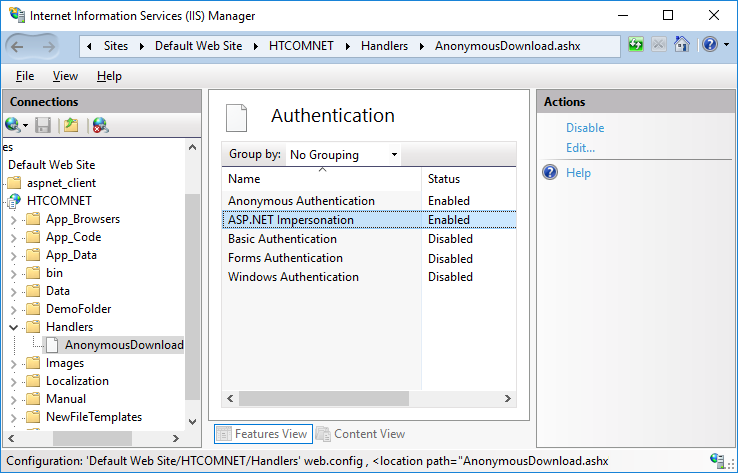 HTTP Commander with Forms Authentication (Anonymous and Forms Authentication in IIS). The application may use its' own account database (Accounts.xml file in Data directory) — Forms Authentication mode or use windows accounts — "Forms with Windows users" authentication mode. There are two options to delegate authentication to HTTP Commander. Pass the user name and password to the Default.aspx page in query string or in POST request. For example, HttpCommander/Default.aspx?username=User1&password=Passw*rd. Shibboleth authentication. HTTP Commander delegates authentication to Shibboleth. See Shibboleth integration for more details. In all cases except Forms authentication across applications, you should have valid credentials to authenticate in HTTP Commander. Thus SSO topic breaks up into two subtopics: obtaining credentials and authenticating in the Web file manager. Basic authentication on the other site: If you have a web site configured for Basic authentication, then you can pass these credentials to HTTP Commander so users will be authenticated in it as well. To authenticate in HTTP Commander, you need to send an AJAX request with credentials to the application. HTTP Commander distribution archive includes an example page BasicLoginExample.html in the Manual folder. Copy the Manual\HttpCommanderAuthModule.dll file to the Bin folder of your main site. 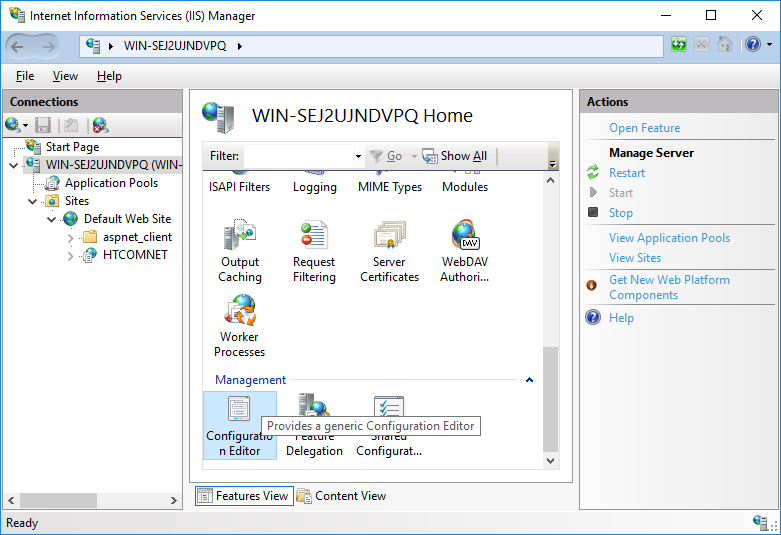 Open IIS Manager and navigate to the site. In Features View double-click Modules. On the Modules page, in the Actions pane, click Add Managed Module. In the Add Managed Module dialog box, in the Name box, type a name for the managed module, e.g. HttpCommanderAuthModule. In the Type box, enter exactly the following: HttpCommander.HttpCommanderAuthModule. Click OK (Note. If you see warning as on the 2nd screenshot click "Yes"). Contact Element-IT technical support if you have troubles with this. Forms Authentication on the other site: If you have a login page where users type their name and password, then you can pass these credentials to HTTP Commander so users will be authenticated in it as well. To authenticate the user, you need to send an AJAX request with the credentials to the application. 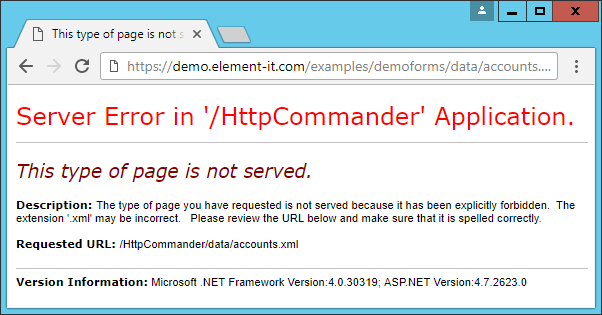 HTTP Commander has a working example page testSSO.html in the application root folder for user login via Form on page. You can look at the code of the page and move it to your login Form or contact us to get help. Copy and rename the file testSSO.html (for example to login.html) into a directory of your site. 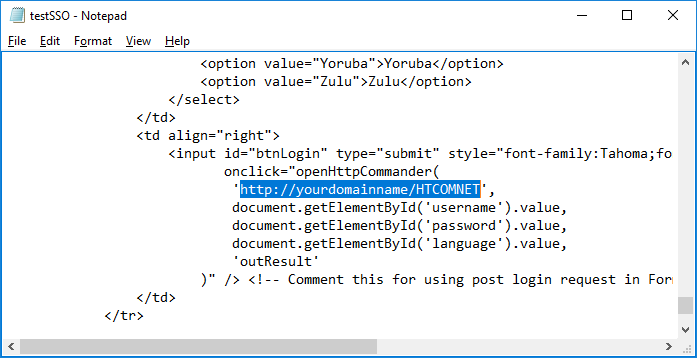 and replace Default.aspx with URL of HTTP Commander (for example http://yourdomainname/HTCOMNET/). Save the file. Check if it works. Open in a browser the testSSO.html page from your site. Enter valid credentials and login. If everything was correct, then HTTP Commander will be opened. Whether check there is an Images\themes\[theme_name]\resources\ folders exists, with nonblank contents and contain the files hc-all.css and have access to them (NTFS rights). Open page in Chrome browser, press F12 and click on Console tab in Developer tools. Look, whether there are errors and what. I got the "Error HTTP 403.18 - Forbidden" when open files from folders with dots in name. This error means that in IIS installed URLScan ISAPI Filter and it is configured so that not allowed URLs in which path there are folders having in the name of a dots (parameter AllowDotInPath=0). 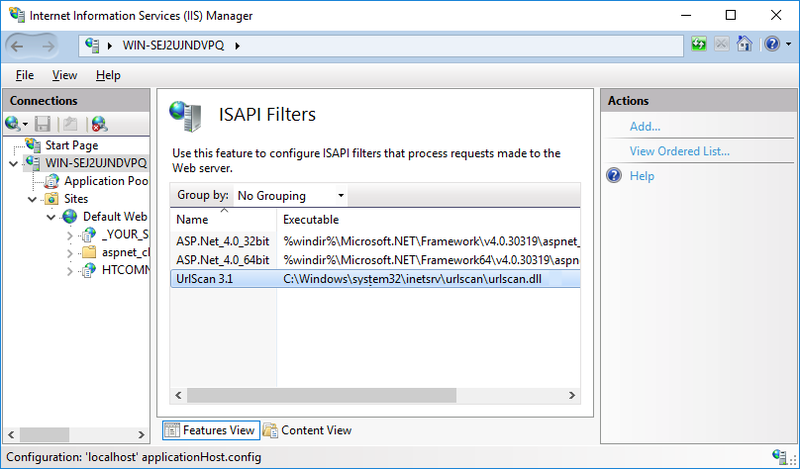 Check URLScan ISAPI filter settings in IIS if it is installed. Double click on ISAPI Filters icon and in the opened list find the filter which name begins with UrlScan. 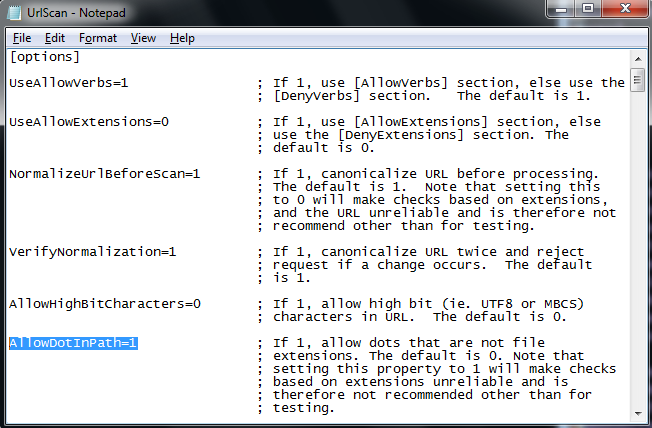 If such filter it isn't found, UrlScan isn't installed, otherwise pass to the following step. Pass into the folder with UrlScan executable file (by default, it is C:\Windows\system32\inetsrv\urlscan\) and open UrlScan.ini file for editing (for example in notepad). In UrlScan.ini file find parameter AllowDotInPath and if value of this parameter not equally 1, set for it value 1 (AllowDotInPath=1), save UrlScan.ini file and restart IIS. This error can arise when reading to the network folder if the site in IIS with HTTPCommander works at a 64-bit platform, and in settings of a pool indicated value True for the Enable 32-Bit Applications parameter. 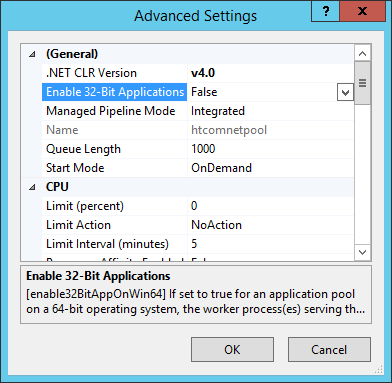 (Application Pools → htcomnetpool → Advanced Settings). See about Wow64FsRedirection in FindFirstFile article. First of all check settings of work with WebDAV and read article Using MS Office and OpenOffice to work with documents. Also check NTFS persmissions for a read-write for a pool of applications and the user who opens the file. If the problem isn't fixed clear Microsoft Office WebDAV cache in registry on computer of user. Microsoft Office reads WebDAV server options when connecting to server first time and stores them for later use. To clear cache just delete all keys under this key. Note! After change registry keys restart computer or WebClient service. Solution: in Web.config file replace Newtonsoft.Json assembly version x.0.0.0 to 12.0.0.0 (where x < 12). See Update to version 5. How to disable WebDav feature. There are 2 ways to completely disable WebDav feature in HTTP Commander. With settings on settings tab in Admin Panel. Open Default.aspx page in text editor. Internet options → Advanced → Multimedia → Play animations in webpages. In the properties window that opens, in Settings section, check the box Enable access-based enumeration. Then click the Apply and OK buttons. In HTTP Commander you then create share. You should type your real share path like "\\servername\sharename". Don't use a full folder path like "c:\foldername" becouse ABE won't work in this case! After ABE is enabled, HTTP Commander will show only the files which user has rights to read and will not show other users files (if there are no read permissions). Answer: First, you need to create the folder on your server file system and configure users NTFS permissions. It is possible to configure the NTFS permissions for students to enable them to create or modify their own files and to disable reading other users files from this folder. You can also configure to enable teachers to view all files. So this folder will be as dropbox there students can upload their own works and teachers can view their works. For this folder it is recommended to enable ABE to hide files which the user does not have rights to read (other students files). In HTTP Commander you can share this folder with students and teachers groups. You can disable some actions you don't want in right "permissions" window. HTTP Commander supports NTFS so users won't be able to modify or view other users files if it is disabled by NTFS. Also if ABE is enabled, then files which the user does not have rights to read will be hidden. Check if the logon user has read NTFS permissions for the HTCOMNET folder. See NTFS permissions section of the Documentation. Try inserting the domain name prefix e.g. "domainname\username". For Basic Authentication, check that you set the correct default domain name at Basic Authentication settings at IIS. See "Application install" section of the Documentation. You can make access only to the local files stored on the same server (you can not use folders stored at remote servers). However if you web server is member of Domain, you can configure Delegation for correct work withNetwork Shares when Windows Integrated Authentication enabled. Dynamic user group membership detection won't work if the application is installed at a non domain controller (but you can make it work if you will use static file as AD info storage. See ADAccountsFilePath key). However it is still possible to get list of user groups from Windows auth token when Windows Integrated Authentication used. On some Android-based devices browsers don't support Windows Authentication but work great with Basic. As conclusion: We recommend to use Windows Integrated Authentication when Web Server is joined into Domain and delegation can be configured. For standalone Web Server we recommend to use Basic auth if you plan to use Network Shares in HTTP Commander and Windows Intergated Authentication if all folders will be local to the web server. If you worry about sending password as a clear text while Basic authentication, you can use SSL. Yes, you can use Network folders with Windows Integrated Authentication when Web Server is member of Domain. But you will need to configure Delegation. Click to select Trust this computer for delegation to specified services only. Ensure that Use any authentication protocol is selected, and then click OK.
Click the Add button. In the Add Services dialog box, click Users or Computers, and then browse to or type the name of the File server that is to be used in HTTP Commander. Click OK. It may take some time for new settings to take effect. Answer: You need to check if the application reads groups correctly. You can see group list in Diagnostics.aspx page. Check if Basic Authentication is enabled in IIS settings, not Windows Integrated. Check permissions for a user to read its own membership info. 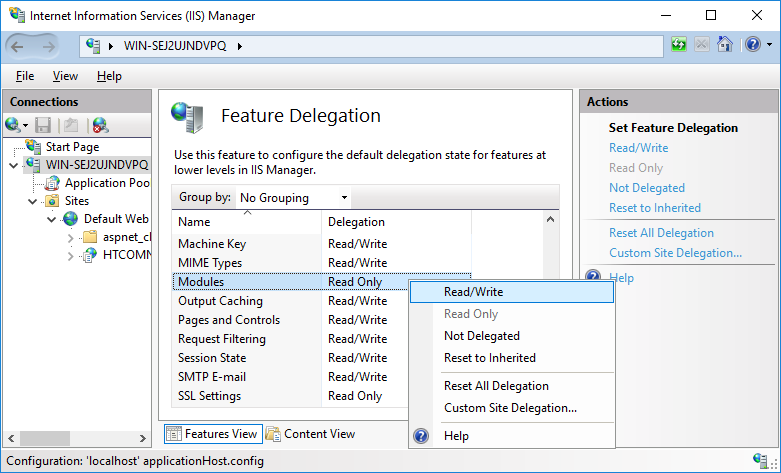 See how to grant permissions at ReadWindowsUsersGroupMembership key description. Answer: Yes, you can. Set UseUniversalWayToReadGroups parameter in the Application settings to "false" and for LDAPContainer parameter value of LDAP path of needed OU (like "LDAP://OU=staff,DC=HOMEELEMENT-IT,DC=COM" ("staff" OU of "homeelement-it.com" domain)). In such a case for the logon user, groups will be detected only from this OU (you can run Diagnostics.aspx to see groups list of logon user). Answer: Yes, you can. You can install the application at the server in DMZ. Open HTTP (80) and HTTPS (443) ports. If you want to use Active Directory groups membership and home folder info then open LDAP port 389 and set UseUniversalWayToReadGroups parameter in the Application settings to "false" and for the LDAPContainer parameter, the value of the LDAP path to your domain controller. Answer: It can be because of reading user group membership info and AD home folder. This needs some time because code connects to AD. You can disable this feature by ReadWindowsUsersGroupMembership parameter or play with UseUniversalWayToReadGroups and LDAPContainer parameters at Application settings. Answer: yes. You have a number of options. Note This solution only works in the Windows version of HTTP Commander. IIS authentication on the target web application (HTTP Commander) should be set to Basic or Windows. 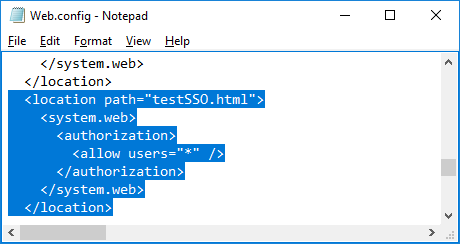 Simply put, testSSO.html page provides an HTML logon form for a web application requiring Windows authentication. 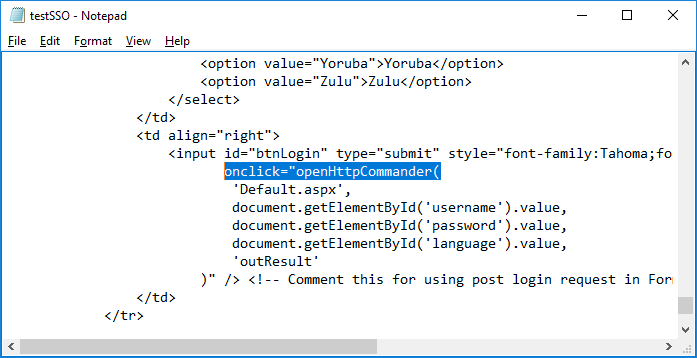 Open the Admin panel in the HTTP Commander web interface. Set "true" value for the WindowsUsersWithFormAuth parameter at Settings tab. Note This solution only works in the Standard (Forms) version of HTTP Commander. Solution 3. Proxy server in front of HTTP Commander. You may configure a proxy server to handle authentication using web form (cookie-based authentication) while the web application is using windows authentication. Some our customers using MS ISA Server successfully replaced Basic Authentication with Forms by ISA settings. Read more info at http://technet.microsoft.com/en-us/library/bb794733.aspx. See also our article Publishing HTTP Commander through Forefront Threat Management Gateway 2010. Answer: Contemporary web browsers cache credentials a user supplied to authenticate to a web application. Unfortunately, they do not provide an interface to clear authentication data on demand (with the exception of Microsoft Internet Explorer). Web browsers clear authentication data when you close the browser, but they normally do not clear them when you simply close the tab. The practical result of this issue is that the Log out button in HTTP Commander does not in fact log the user out in any browser except Internet Explorer. After log out you may continue to use HTTP Commander under the same user you used to log in the last time. You'll not be asked to authenticate again. The only reliable method to log out is to terminate the browser process. HTTP Commander implements a workaround to this problem. That is it makes the browser to forget user credentials. The user has to authenticate in the application after logout to continue using HTTP Commander. You need to go through a few configuration steps to activate the solution. 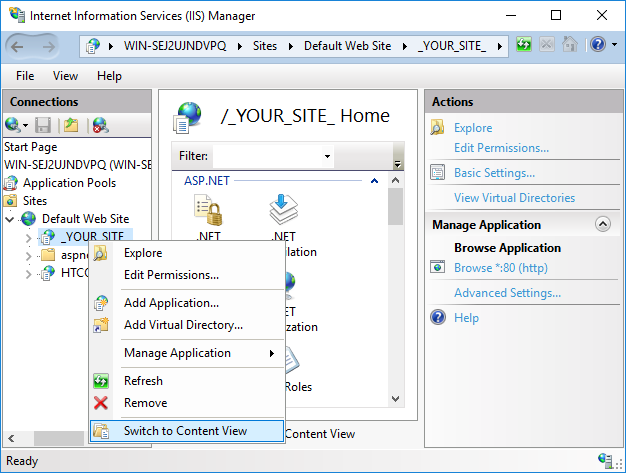 Locate the HTTP Commander application in IIS Manager, switch to Context view. Locate ForceLogout.aspx, right-click on in, select "Switch to Features View". Enable Anonymous authentication, disable all other authentication types. 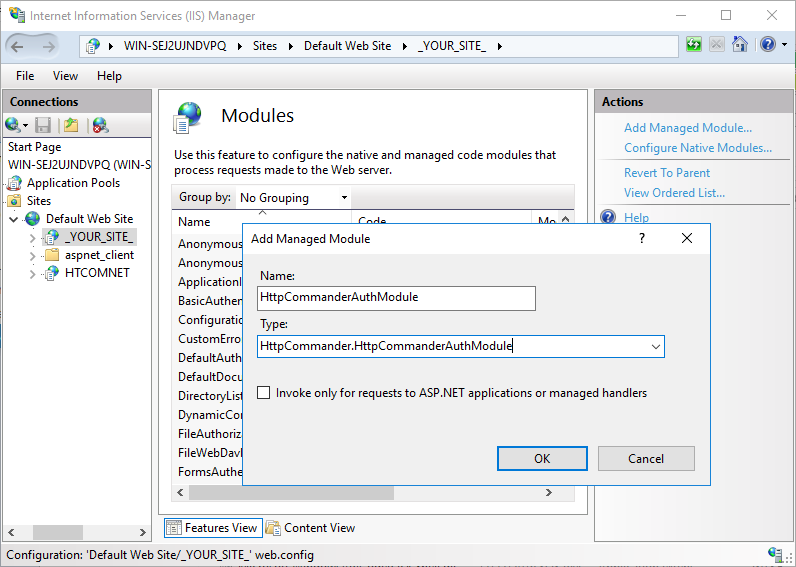 Open IIS Manager, click the HTTP Commander application on the tree panel. Select basic authentication (it should be enabled). Click Edit on the Actions panel. Specify the value of the realm field. You may use any non-blank string for the realm parameter, for example, name of the server machine. 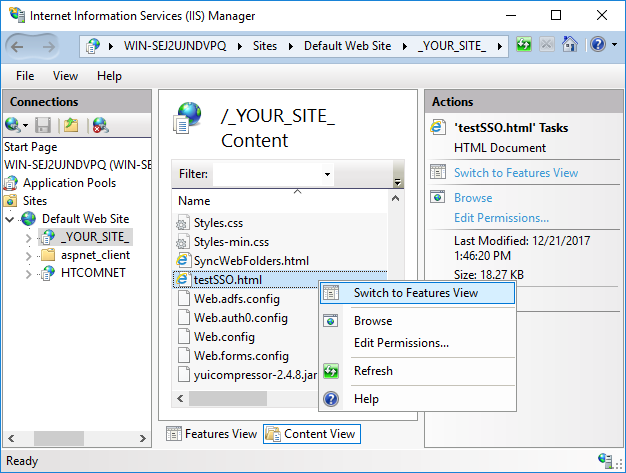 The point is you must specify the same value in both IIS manager and in HTTP Commander settings. Open the Admin panel in HTTP Commander. Click the "Show hidden parameters" button on the top panel if hidden parameters are not shown. Set the BasicAuthenticationRealm parameter in the main section to the value you've assigned in IIS. Answer: This problem can arise because of caching the mapping between the SID and the user name in a local cache on the computer. For obtaining more detailed information and problem elimination, see LsaLookupSids . Answer: This problem is because Anonymous Authentication is enabled in IIS. It is necessary to disable it. To check it, you can open IIS or launch Diagnostics Page (Authentication Mode section). See also Manual configuration authentication mode. How can I display some text when user logs into HTTP Commander (at the time when popup login window appears) instead of white screen? Answer: You can create separate html page which will be available without authentication and redirect to Default.aspx page immediately after load of this page. This will result to render page with your custom text while users enter their credentials. For example you can explain which credentials should be entered, which users are allowed, what users will see after login, etc. Create new html page in root folder of HTTP Commander. For example, index.html. Edit contents of that page to display some useful information. Expand Web Sites, Default Web Site, HTCOMNET. Right-click the "HTCOMNET" virtual folder and select Switch to content view in the context menu. In the list of files in the middle panel, select the index.html file and click the Switch to features view option. Now you may change settings pertaining to the index.html file. Click the Authentication feature on the central pane. 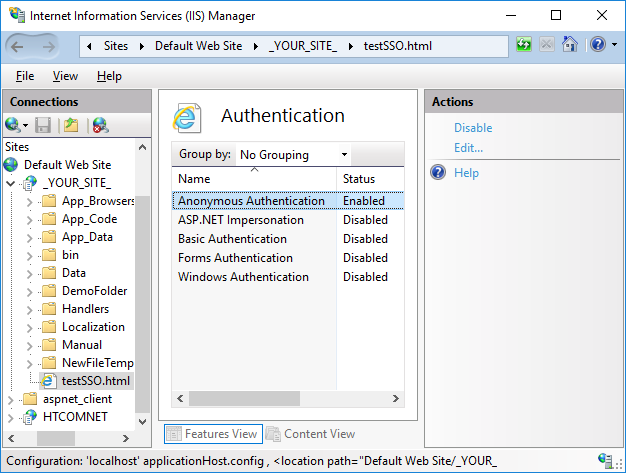 Enable Anonymous Authentication and ASP.NET Impersonation. Disable other items. Use link to HTCOMNET/index.html file to display contents of index.html page during login process. First of all, check if Impersonation is enabled for the application and Handlers folder. Then check the NTFS folder rights. 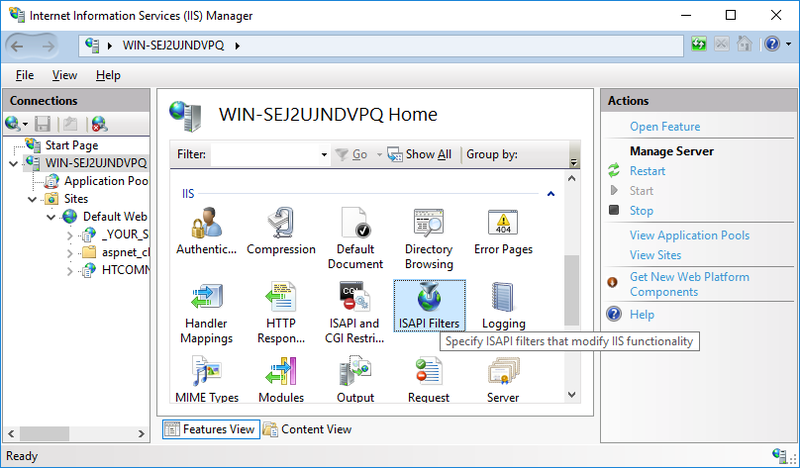 Stop IIS (in IIS Manager, on the left in the Connections tree, highlight the server, and then on the right in the Actions - click Stop).